Representatives of WoW visit the town of Beit El in Samaria and meet with Arutz Sheva Director, air their views and hear her response. 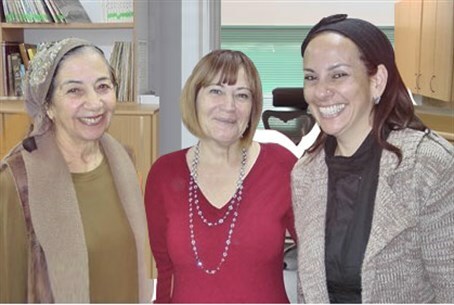 Representatives of the Women of the Wall (WoW) protest group visited the town of Beit El in Samaria today, and met with Arutz Sheva Director and Founder, Rabbanit (Rebbetzin) Shulamit Melamed. Rabbanit Melamed is the wife of prominent Religious-Zionist leader, Rabbi Zalman Melamed, who is the Rosh Yeshiva (Dean) of Beit El Yeshiva (Torah academy). At the meeting, the WoW representatives sought to explain their controversial activities, which have resulted in them being offered a separate prayer area at the Kotel (Western Wall) to conduct their own non-traditional, monthly prayer service, so as not to offend the regular worshippers at the Wall - an offer they have so far rejected. The Women of the Wall pray and sing loudly, wear prayer shawls, skull-caps and phylacteries and have tried to organize reading from a Torah scroll at the Wall. They contrast sharply with the traditional forms of prayer that fill the holy site. Many observant Jews are against any departure from traditional custom and they are the majority at the Wall at any given time. And because blessings are only said by those commanded to observe a specific commandment and women are not obligated to read from the Torah, all Orthodox groups agree that it is halakhically forbidden for women to recite the blessings over the Torah. The women began by emphasizing that they are not officially aligned with the Reform movement or seeking to undermine the Orthodox (halakhic) stream of Judaism, and expressed regret for the sometimes violent clashes triggered by their actions at the holy site on Rosh Chodesh (the start of the new Jewish month), which is when they come to pray. Women of the Wall Director Leslie Zacks said that the group's leadership contained only one member of the Reform movement, with the rest identifying as either Orthodox or Conservative. "There are varied opinions within Israeli society, and it is important for me to stress that I consider and respect them all," she said, lamenting what she considers "disinformation" about her organization. Specifically, Zacks said, she rejects attempts to label her group as "anti-Zionist" because of recently-made claims that Women of the Wall had connections with left-wing NGOs, and funding from the radical-left New Israel Fund. "Some of us serve in the IDF reserves, and all of us recite the Prayer for the Welfare of the State (of Israel)," she insisted. Zacks added that their intention was not to anger people but to secure a "respectable place of prayer" for them, and that they were currently in negotiations with the government to secure a space for them on the main Kotel plaza. However, a recently opened, specially-constructed alternative prayer site at Robinson's Arch has been rejected by the group, with many of its activists refusing to back down on demands for non-traditional prayers at the Wall itself and some claiming erroneously that the proferred site is not the "real Wall." Dr. Ella Kaner, an Orthodox WOW member from Petah Tikva, described herself as a practicing Orthodox Jew and said she didn't see a problem with the petition to allow alternative forms of women's prayers. Kaner also insisted the group's action were not meant as a "provocation", and said that her aim was to "empower" and bring Jewish women closer to Judaism "each in their own way". The fact is, however, that the hundreds of traditional women who fill the Kotel from pre-dawn to night every day are provoked by the group's activities. Rabbanit Melamed, while hospitable and welcoming, expressed her "pain" at seeing Rosh Chodesh celebrations being used as a vehicle to provoke angry clashes and divisions at the Kotel plaza, and expressed her opposition to the group's activities there. "Your prayer services during the past few months at the Kotel appear to me as nothing more than an unnecessary provocation," she said. "Why come to place with many years of tradition in accordance with Jewish law, to change the accepted customs - the status-quo - and to disturb so many women who regularly come to the Kotel in order to pray?" she asked. "It is difficult for me to understand why it is so pressing (for you) to come specifically to this place. At the end of the day the actions at the Kotel cause strife, profane God's Name, and foment unnecessary arguments and controversy. Why not wait until the government finds you a solution?" Rabbanit Melamed emphasized that "Mrs Anat Hoffman, who represents your organization in media interviews - or at least in interviews to the foreign media - has explicitly said that her goal is to implant the Reform movement within Israel." Hoffman was filmed on British television admitting that this was her real goal, leading some observers to conclude that the Orthodox feminist members of WoW are being used as a smokescreen. "Hoffman's goals are to advance the Reform stream's (agenda) within Israel, and from our perspective this is very serious indeed. "It is possible that your intentions, as you presented them here, are good, but the result could be catastrophic. We are talking about a slippery slope that poses a great danger to Judaism"
Dr. Kaner responded by saying that in her view it was important to be flexible in respecting different ways of "connecting to God", saying that as an Orthodox Jew she has never compromised on halakhah (Jewish law), but that she felt the work of Women of the Wall was important in "bringing more women to the Kotel". The WoW have never numbered more than a few dozen at their once-a-month prayer meeting, except for the few instances when they brought in buses of reinforcements. Rabbanit Melamed concluded the meeting by calling on Women of the Wall to prevent the regular Rosh Chodesh clashes at the Wall, and noted past generations have seen numerous attempts to make Judaism more "accessible" by straying from the halakhic system, all of which "failed miserably". "Study the statistics of the descendants of Reform, Conservative and Orthodox Jews and you will see that whereas the descendants of Reform Jews leave Judaism and assimilate altogether, and a large portion of Conservative assimilate, among the Orthodox the vast majority remain Jewish," she noted, and stressed that legislating and deciding on the limitations of Jewish law were the province of Torah Sages, not individual groups.